If you aren’t familiar with Meyer lemons, you are missing one of the more exceptional species of citrus fruit. The Meyer lemon is a cross between the classic Eureka lemon and a Mandarin orange. The fruit is slightly rounder in shape with a thinner skin which is deep yellow in color. The flavor is less acidic than that of the Eureka lemon; having a more floral aroma. The Meyer is grown commercially in California, but their delicate nature makes transporting a challenge. So, where you may ask do I get my Meyer lemons? They are seasonally available at local farmer’s markets and at some specialty stores. Fortunately for me, I’ve never had to depend upon either of these resources as I have my own personal source, whom I shall refer to as PK. PK is a dynamic woman, mother of a dear friend of mine, and supplies me with an endless bounty of Meyer lemons. Although she has lived in California for years, PK is a New Yorker through and through. Her direct unapologetic approach to life, never willing to accept second best for herself or her family, is ever so refreshing. The attractive and chic PK is articulate and quick witted. She is a true Renaissance woman – mother, grandmother, real estate maven, financial wizard, multi-media artist, world traveler… oh I could go on. It should come as no surprise that PK is also an accomplished gardener, keeping me flush with Meyer lemons. PK like the Meyer lemon possess just the right balance of sweetness and acidity. 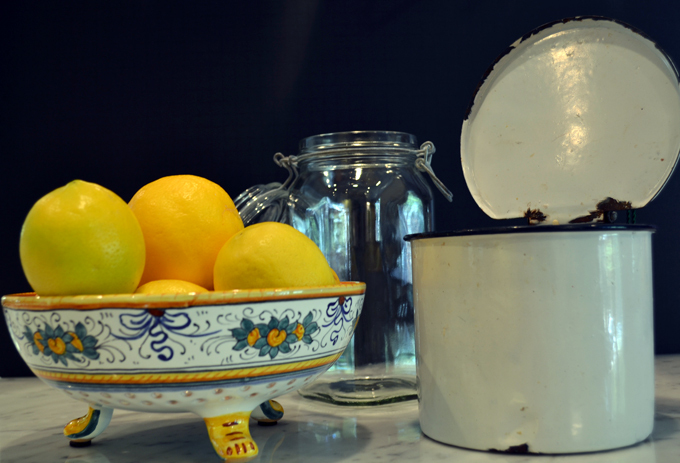 Preserving lemons is certainly not a new concept, it has been done for years and the general procedure is the same. One only needs some well scrubbed lemons, salt, and a mason type jar. Herbs or spices such as rosemary, peppercorns, bay leaves or cinnamon stick are perfectly wonderful flavoring agents to add, however I prefer to have the essence of the lemon at the forefront and reserve additional seasoning for the particular dish I am preparing. If Meyer lemons are unavailable, the classic Eureka or Lisbon lemon will do fine. Once you have a stock of preserved lemons, the possibilities are endless. We keep them on hand and often use them to flavor chicken, fish, and vegetarian selections throughout the year. Wash each of the lemons well under cold water, set aside. Have a cutting board, pairing knife, kosher salt and the jar at hand. I find working at the sink is the easiest in terms of containing the juicy, salty mess. Cut 4 to 5 lengthwise slits into each lemon starting below the tip and stopping before you reach the end of the fruit that was attached to the tree. 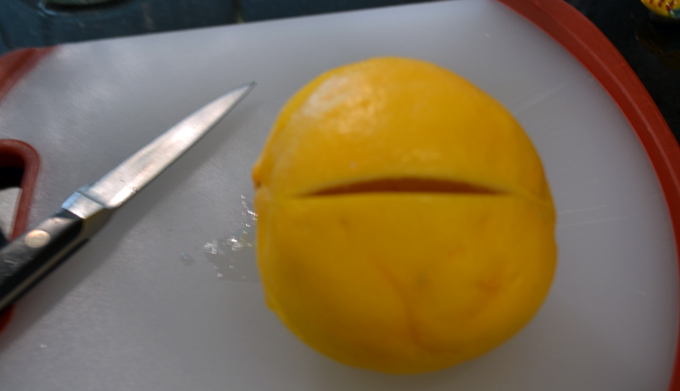 The depth of the slits should reach the center of the lemon. 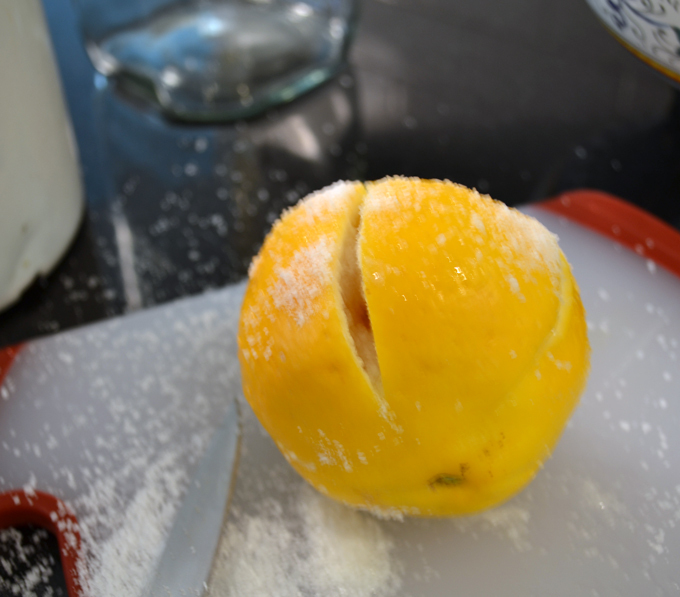 Holding the lemon over the sink or the jar, apply slight pressure on both ends of the lemon so as to open a slit and insert some salt inside the slit. Repeat this with each of the slits on the lemon. 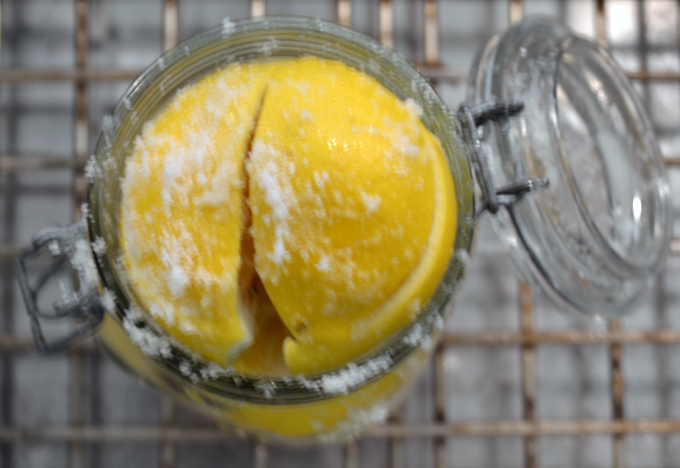 Once finished adding the salt, place the prepared lemon into the jar gently squeezing the juices into the jar along with the lemon. Repeat this process with the remaining lemons, placing them in the jar one by one. At a certain point, you will need to compact the lemons. Continue unit the jar is full, top of with the additional lemon juice and/or spring water, cover and place in the refrigerator. After 4 to 5 weeks the lemons will be ready to use.